Corporate venturing is on the rise around the world once again. It may feel like the entrepreneurship and startup hype is at an all-time high in terms of popularity and merit, also within big corporations. But the truth is that many industries have been down the corporate venture road before, and it has not always led to happy endings. However, the case for corporate venturing is different this time, and corporate venturing as a concept and business function is changing. The big differentiators, compared to the previous surges in corporate venture initiatives, are that this time there are tremendous amounts of data available, a better understanding of the ups and downs of corporate venture development, and much better tools to govern and advance these initiatives. Corporate venturing has grown up, and is now a potential tool for evidence-based business innovation and growth for a larger spectrum of firms. This embraces all of Eicorn’s core values and expertise, allowing us to effectively leverage these differentiators for our clients. We focus on lowering their internal barriers that inhibit the creation of new and diverse corporate venturing initiatives, as well as maximising the total value created. 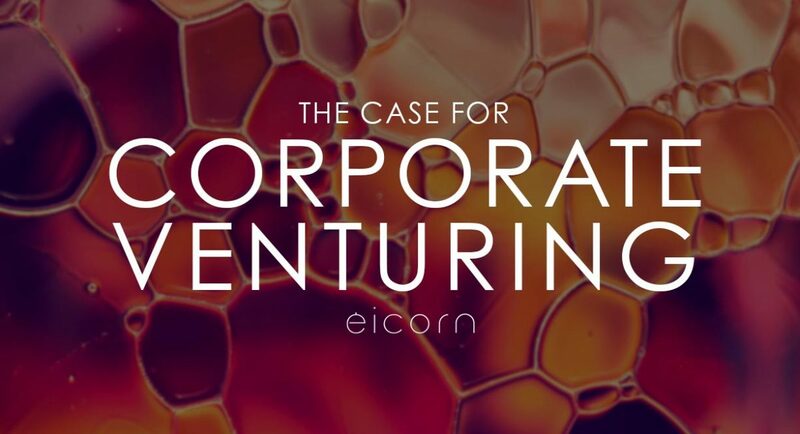 At Eicorn we are also working hard and relentlessly to drive the conceptual evolution of corporate venturing forward, expanding the toolkit for many corporations beyond equity investing, to also include virtual and physical corporate business incubators and accelerators. During the past 10 years, a multitude of empirical studies have established and interesting fact: Big corporations embracing a corporate venturing model that leans towards open innovation, incubation and acceleration programs, enjoy the strategic advantage of having many more real options than their non-venturing competitors. This portfolio of future possibilities mainly comes in the form of external innovations brought to the big firm’s attention and use by their support of relevant startups, inventors and entrepreneurs. These are real options for future growth that the corporation has acquired with a huge discount compared to the cost of in-house development of equivalent assets or through traditional M&A. And that’s not even taking into consideration whether an in-house R&D function even has the same capabilities to innovate in the same direction and speed as outside startups. It is however important to establish the difference between generating these real options as a venturing corporation, and exercising them. Too many corporate venture programs fail to strategically align their efforts with the overall corporate strategy, as well as to involve and get the commitment of the top executive leadership. This results in lost opportunities for big corporations and disappointment from the startups representing these opportunities. When we work with corporate venture setups, we emphasise focus on establishing a strong connection between the corporate strategy, the venturing strategy, and the senior management. Here, the insights to how high-performance ambidextrous organisations work is a key to getting the incentives, design and communication right. The most progressive and successful companies that initiate various corporate venturing schemes also create long-term mechanisms for positive impact on the mother organisation. A well-designed long-term corporate venturing function in a large firm has the capability to influence the whole company in a positive and value-adding way. This is often described as instilling “entrepreneurial spirit” in the workforce, or creating an innovative mind-set where anyone can contribute ideas and improvements. In reality, a more correct description would be to say that over time, the mother organisation develops a collective acceptance of constant change and management questioning the status quo. This statement may seem like nothing more than a semantic juggle, but understanding the difference is key to leveraging this particular advantage of corporate venturing. Rather than expecting the larger organisation to become entrepreneurial in itself, which rarely happens, managers should focus on the organisation’s gained receptiveness to working with novel technologies, external entrepreneurs and emerging intrapreneurs. It may also be possible to leverage the corporate venturing function’s emotional focus on future opportunities (curiosity) to balance the organisation’s sometimes unhealthy attachment to old corporate pillars (nostalgia). It should come as no surprise that startups often hold the key to nascent markets by both discovering and creating previously unmet customer needs. Whether this phenomenon is described as disruptive innovation, breakthrough innovation or market creation, it springs from independent entrepreneurs’ ability to operate much closer to a potential new market. We often describe this with a colourful metaphor: As startups “marinating themselves in the problem of their customers”. To know a specific problem or challenge better than anyone else is a proven path to successful innovation and strong competitive advantages, and a key to dominating future markets. Large corporations are naturally disadvantaged when it comes to understanding nascent market needs. The “novel-problem-marination-strategy” described above, successfully practiced by intrinsically-motivated entrepreneurs, is not generically reinforcing the extrinsically-motivated corporation’s strategy (generally to dominate an existing market) or purpose (generating profit). The corporate venturing function allows big corporations to partner with individuals and startups that are today’s thought-leaders regarding some of tomorrow’s greatest opportunities. This connects well to the first point above – to build a portfolio of real options – but also establishes a foundation for a better understanding the future of markets: A vehicle for corporate foresight and ultimately a strengthened corporate strategy. The shortest answer to this question is: “We are marinating.” That is, we are a boutique innovation and management consultancy firm, yet with extensive entrepreneurial and corporate experience, that have decided to marinate ourselves in the challenges that managers in big corporations face when looking to set up new corporate venturing initiatives. Our small team works hard to understand and master these challenges better than anyone else, and to package our knowledge as services and hands-on support to large venturing organisations. We focus on developing management depth and breath as a key factor to success, and long-term commitment from key stakeholders within the firm. We take lead to deliver on pure operational aspects, such as getting these initiatives up and running in time and on budget. And we help with the creation of assets and capabilities that generate opportunities for partnerships, investments (deal flow) and business development in collaboration with startups and entrepreneurs. Let us discuss your Corporate Venturing ideas!